Super sweet and super fun. Happy Valentine’s Day! Dude, you should post the blank PDF of this so I can use it for my husband! Please? and not to be creepy or weird, but i’m definitely re-posting! So funny. 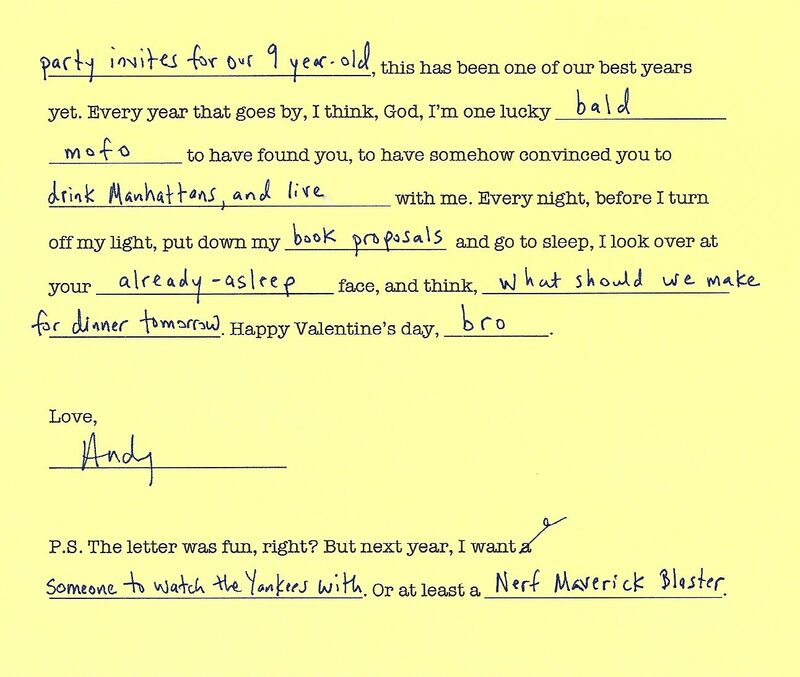 I love the “bro” in Andy’s letter. I love Andy’s edit at the end. Hilarious! Love it! This is getting copied and sent to my dear dh who I know plans to grab the last batch of mixed flowers from Penn Station on his way home tonight. But he did cook me a meal last night… so all is not lost. But love letters never get old and this is one incredibly smart ode. This made my morning! You both never fail to crack me up. I especially enjoyed your line about convincing your husband to write mad lib love letters in the name of your “career”! That had me laughing out loud. Happy Valentine’s Day to both of you! i can never take this day seriously. thanks for confirming that with happy valentine’s day BRO. my thoughts exactly. thank you, i dug this post. I second the comment that said you should offer a PDF of this. It’s great. Happy Valentine’s Day to you. This is hysterical! Reads like an ad for why marriage is so awesome! awesome, hilarious and human all at once. Oh! I forgot to mention due to tears of laughter that I made the “salmon when you are sick of salmon” recipe. A huge hit. Even Nate gave it an 8! Yippee! PDF, please!! I’ve only got a few hours left and this is way better than the card I had planned! 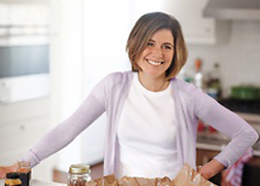 As much as I love your cooking posts, it is your family posts I always love the most. This is so cute and funny. My husband and I are not as creative, but I will be very happy when he perfectly grills the rack of lamb I bought for dinner tonight. BTW Jenny- I had a maternity body suit with leggings attached that I wore daily until one of my sisters finally had the nerve to tell me how bad it looked! Have the scary pictures to prove it! Hubs and I write each other a love letter every year on Valentine’s day but I LOVE this. Keeping for future inspiration. I knew I loved you (not in a creepy way) when I read your post about how you obsessively counted the ounces of breast milk in your freezer–this has cemented it. 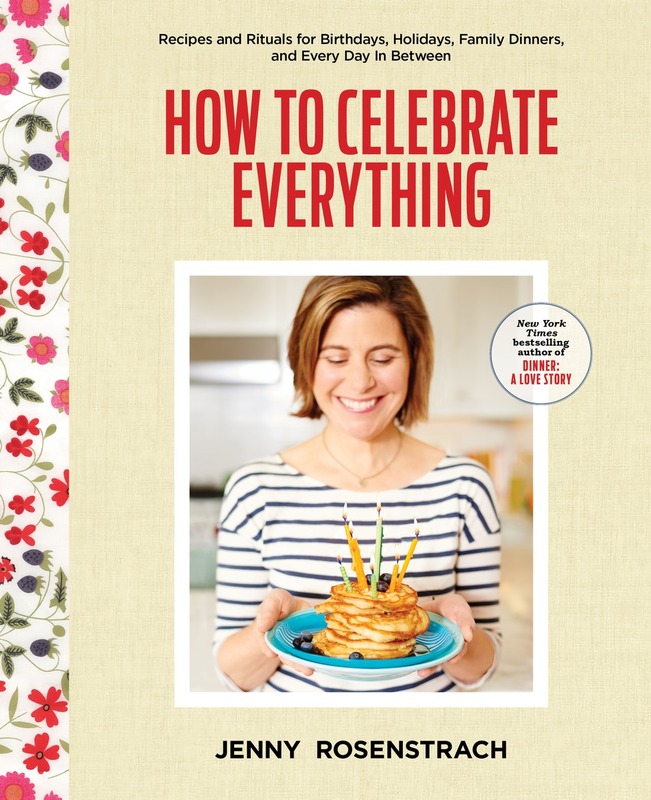 A blog about marriage and raising kids (oh, yeah, and cooking) that actually makes me feel both inspired and relaxed instead of inadequate and overwhelmed. Thanks so much and happy Valentine’s Day–here’s to unwrapping a copper pot at the Breslin next year–or maybe not. OMG I heart this. Big time. 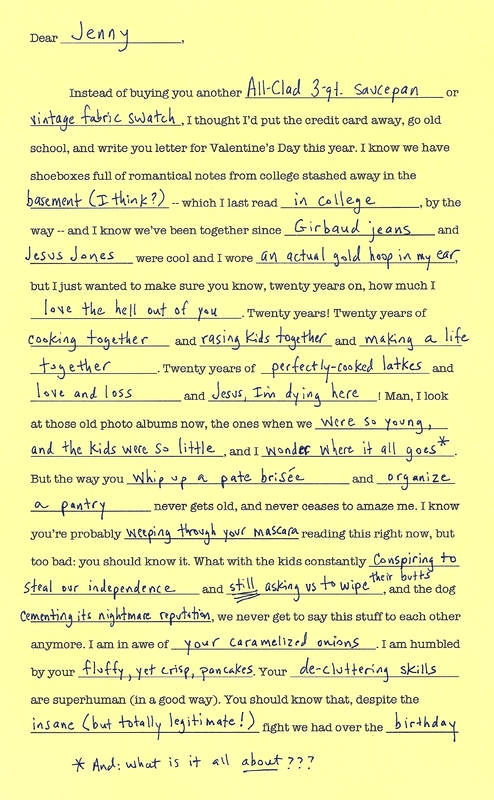 Oh,i’m in love with your blog, and hope one day to find someone to write madlibs with! lol! one question, did you see each others answers before writing your own? or was the coincidences just coincidences? Great Idea on the Mad Libs!!! 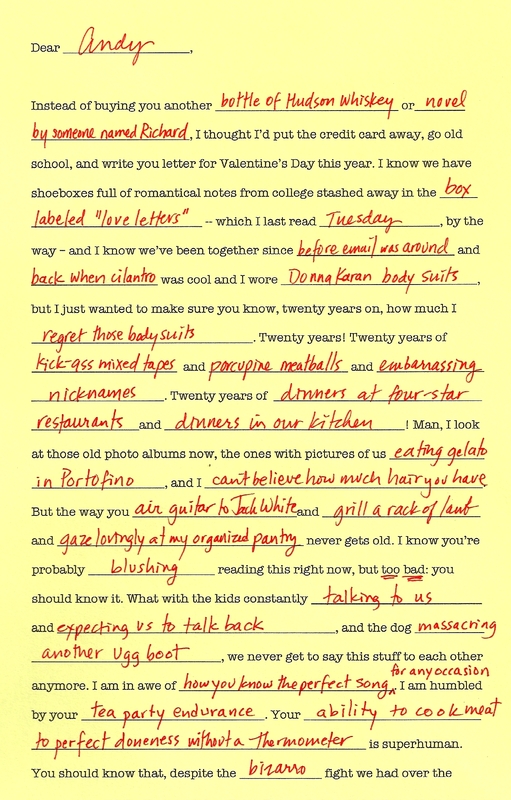 Please, please, please post a blank PDF of the Valentine Mad Libs. 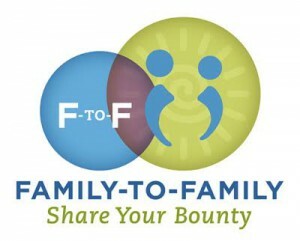 I REALLY want to do them with my husband next year. This is awesome! I bet your kids couldn’t figure out why you two were giggling like school kids all night. Another reader who also celebrated her 20th Valentine’s Day with her college sweetheart this week and is too lazy to retype this or make her own. PDF pretty please? My fav line: ” STILL asking us to wipe their butts”. This was so sweet (and absolutely hilarious). I second the request for the PDF, if you could be so kind!! Love so much about this but had to comment on Donna Karan bodysuits–I remember thinking they were the height of sophistication/ease, so this KILLED me! This is actually really funny. I am impressed that you still have time to make dinner! You should really post a blake page that we can fill in and use! I loved this! This is very funny letter, I am happy to see your blog. Thanks for this.